Whether you have a large or small yard, it’s always good to keep them organized and neat. 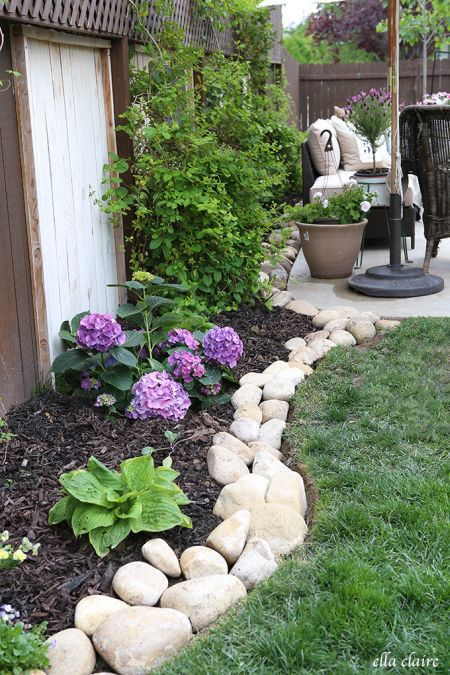 One way to spruce up your garden is to use one (or more) of these beautiful lawn edging ideas. These allow you to section your yard into different areas so that there’s a distinction between the grassy patches, flower beds and bushed. 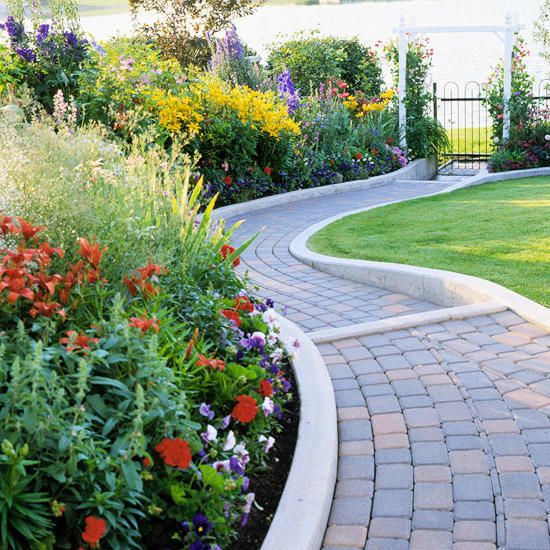 Borders and edges also make pathways look cleaner making them more appealing for people. Plus, delineating these areas helps you keep the grass in check from overgrowth, which can easily make your garden look disheveled. Simple and inexpensive, yet lovely to look at. 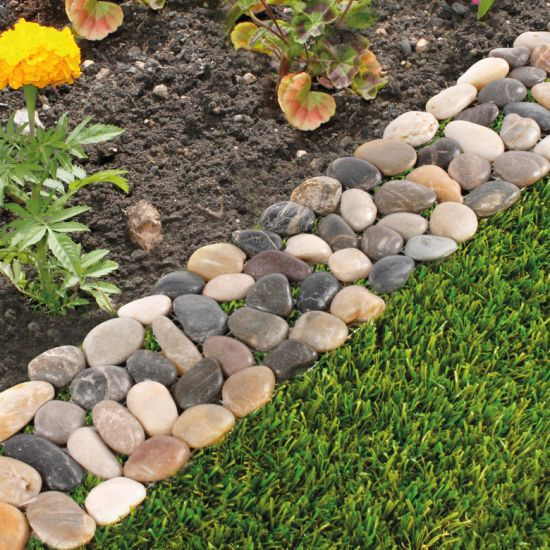 Pebble borders are easy to make on your own. 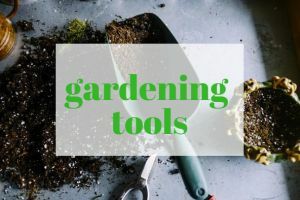 They don’t require a lot of DIY work on the gardening or handyman side. Plus, you get the option to design the pebble border the way you want. 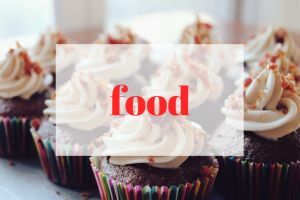 You can make it as thick or narrow as you want. Plus, have the freedom to use different colored pebbles to give it your own personal touch. Cast concrete edging does require a bit more work. You’ll also need to do a bit more planning since the concrete path along with the borders will be more permanent. In addition, you probably want to have professionals do it. That way, they look clean and net. We’ve seen enough DIY concrete work to know that if you’re not experienced enough, you can mess up awesome planning with poor execution. This is very similar to pebble borders. But, instead of small rocks, you use larger stones. 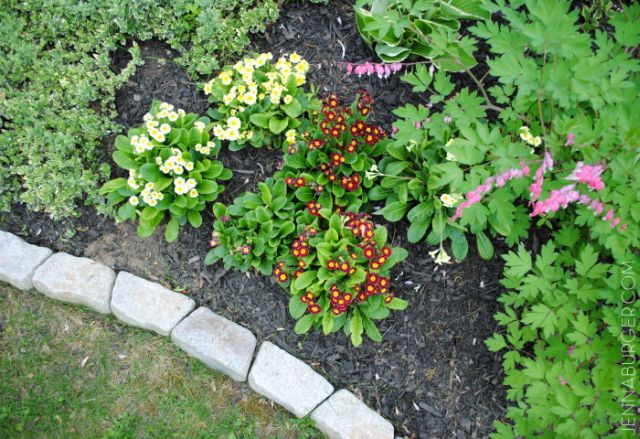 These are great around flower beds as well as areas around the house. The rocks not only give you contrast of colors to the soil, grass and plants, they also add a different textural dimension to your yard. If you have a brick home or sections of the wall around your yard made with bricks, this is a great idea. 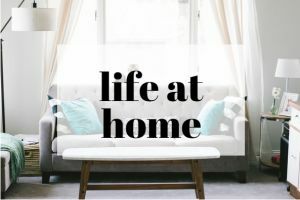 It complements the surrounding design and gives you a cozy, classy look. 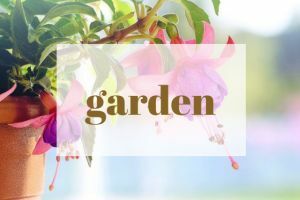 Using red bricks also darken a very bright garden or backyard which helps give color variety that makes it pop to anyone who visits your garden. Besides red bricks, you can use stone bricks or halved concrete slabs as well. They offer a different look and texture that works well in darker gardens by brightening up the overall look. This is perfect if you have a lot of trees, wooden areas or patches. The lighter gray color contrasts the dark brown soil which helps make them more attractive to look at. If you’re looking for a more rustic feel, using flagstone is a great way to do this. Using uneven slabs make it look more random although still very uniform. This gives it an extra layer of texture from the edges and corners. These added features make them have a much different look compared to the straight edgings that concrete or bricks give you. One of the beauties of using this style, is it gives you more freedom to be creative. You can made certain areas higher than others and adjust how much unevenness there is. 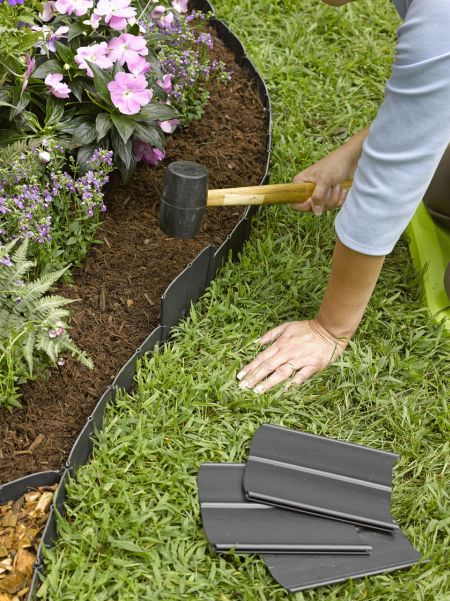 Pound-in plastic edgings are quick, inexpensive and practical. They let you separate your garden into sections which can help you easily monitor each area. This also makes it easy to care for different types of plants should you decide to use different treatments per section. 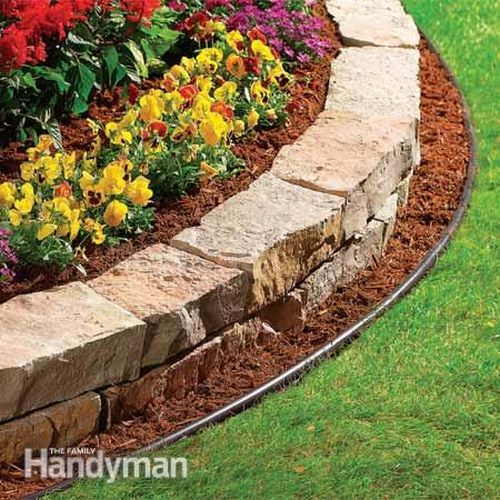 This type of edging is perfect around your garden. It’s probably less useful within the yard to separate different areas. 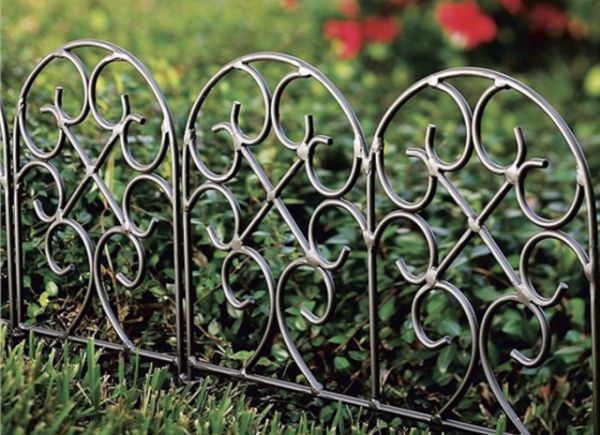 The iron scroll works like a small fence around your garden that tells everyone where it ends. One of the best things about this edging idea is that you get to choose the type of material and design you want. This lets you be as creative as you want to be. Plus, it’s versatile enough to be used for taller plants. 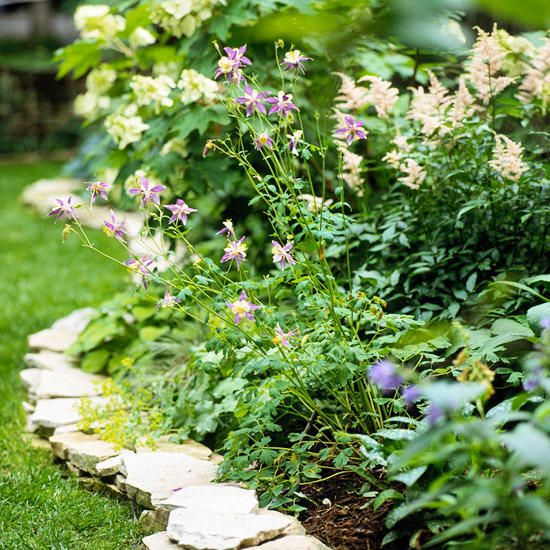 Some types of edgings may not be appropriate for plants that are taller than one to two feet. But, with this type of fencing, you’ll be able to choose the exact one that suits your garden. The photo above gives you an amazing before and after look at what this type of edging can do for your lawn or garden. It instantly gives it more life and color while brightening the entire area. The brick edges not only help organize the area into sections, it also makes it look so much more appealing to the eye. 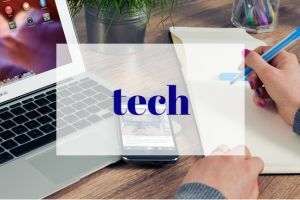 GoodandEvo.net is a participant in the Amazon Associates Program, an affiliate advertising program designed to provide a means for sites to earn advertising fees by advertising and linking to amazon.com and affiliated sites.